Merrick joined the family business in 1984 on finishing full time education and has built up a vast technical knowledge of the industry and managerial skills over the past 35 years. Outside of work he is a family man and loves nothing better than taking a family holiday or walk with his wife Jane and Barney their Border Collie. In his spare time he is an active sportsman and can be found either playing a round at Ashley Wood Golf Club, Skiing down the piste, standing at the end of a table tennis table or on the side of a football pitch coaching. Simon also joined the company straight from school following in his father’s footsteps. 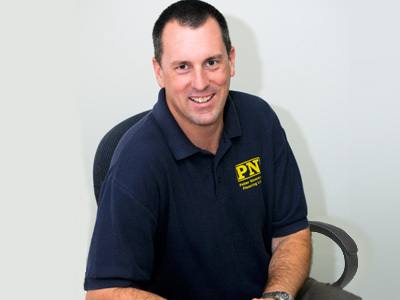 He has been with the company for 25 years again building a vast knowledge of the trade. He lives locally in Corfe Mullen with his wife and two young children which take up most of his spare time but can often be found escaping with fishing rod in hand for the peace of the river bank. Harry joined the family organisation in 2016 following in the footsteps of his Grandfather, Father and Brother. Having grown up around the flooring business he has soon established a sound technical product knowledge and commands a mature rapour with our clients. Harry splits his time between our two showrooms. His outside of work interests include playing Football and Golf along with the occasional party night in Bournemouth or Ashley Cross. Jerry joined the company on the opening of our Ferndown showroom in 2010 as Showroom Manager bringing 35 years wealth of practical and technical knowledge having been a former installer and flooring business owner prior to joining us. Outside of work Jerry loves spending time with his grandson and is very active in his community. Andy joined his step father Merrick as an apprentice and worked for the company for several years after completing his training before venturing out on his own in the industry forming his own company A J O’hara Flooring. During this period Andy has become an active member of the ‘Floorskills family’ the industries UK’s premier training provider and has built a large network of experienced fitters across the country. He now has re-joined Merrick and the team as an experienced installer and sub floor preparation expert. 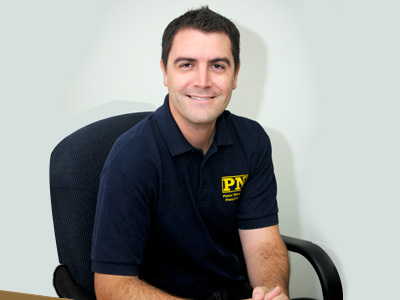 Andy holds NVQ 2 and is also 1 of only a couple of Quickstep Master Installers in the area. He has recently moved to a slightly more administrative role looking after our installers and providing training for our apprentices .He also looks after the company’s Facebook page and helps out in the showroom. He also spends most of his spare time away on holidays or long weekends away with the family, the Golden Retriever Hudson and his caravan. After joining the company in 2000 to assist on a large project Shaun’s time is now split between organising the warehouse , driving the company’s support vehicle delivering materials to our installers and clients and carrying out sub floor preparations ahead of our installers. Whilst at home he enjoys nothing more than cracking open a nice cold beer and settling down infront of the TV. Julie has been with the company for 28 years joining straight from school. She keeps a very keen eye on all the company’s finance’s and ensures a tight ship is run. Dave is the company’s longest serving employee having been with the company since 1982 again joining direct on leaving education some 36 years ago. He has an NVQ 2 in Textile and Hard floor covering installations and CSCS, Asbestos and Manual Handling certification. Away from work he loves spending time with is dogs and towing his caravan around the country for weekends away with his partner Jayne. Darren another serving member has been with the company for 34 years. Like Dave , Darren now specialised in our Domestic Installations and is a very conscientious and fastidious worker. An avid football fan he will be seen at weekends either making the long trip to Manchester to watch his beloved United or down to the Vitality Stadium with his wife Linda to watch Bournemouth. Darren also works in the Ferndown showroom assisting customers with their floor selections. Clive is the company’s elder statesman and has been with the company since 1999 joining when he relocated to the area from the Midlands. He brought a wealth of knowledge and experience to the installation team and holds an NVQ 2, CSCS, Asbestos and Manual Handling certification and his energy is limitless. Life away from work is enjoying the simple pleasures of time with the family and Grandchildren and a sup on the odd alcoholic beverage. Nick acts as our site supervisor on major projects aswell as being a very capable fitter himself. He also holds an NVQ 2, CSCS, Asbestos and Manual Handling certification as well as SSSTS. He has also completed the advanced carpet fitting course at Floorskills and is always keen to attend any avaible training course to further his education. Nick has been with of since 2003 following a short carpentry apprentice after leaving education. He has a young family which takes up most of his spare time but still manages to find the time to pop his head under the bonnet of his old Mini. Tom has joined the team after years of running his own business River Flooring bringing a wealth of knowledge and fitting skills. He is a Quickstep Master Installer and is also currently taking his NEBOSH health and safety exams to become our Health and Safety expert. Outside of work he is a passionate cyclist and loves a walk with his dog. 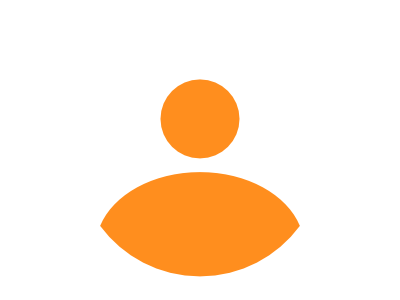 Stuart started with the company on leaving education where he gained a sound knowledge of the industry over many years . He now operates his own company Stuart Cannie Flooring but sub contracts back to ourselves 4 days a week. Stuart holds NVQ2 and full CSCS cards. Chris like Stuart sent many years training with ourselves and now also operates his own company Future Flooring but still sub contracts back to us 4 days a week. Chris holds NVQ2 and full CSCS cards. Henry has been with the company for 2 years and has just completed his NVQ2 and CSCS at Floor Train. He is progressing in his knowledge preferring to specialize in carpet installations. Chris like Henry has been with the company for a couple of years after joining from another local flooring company. He has just completed his NVQ2 and CSCS at Floor Skills and is continuing to improve his installation skills working alongside our experienced fitters. Brady has recently joined the company after completing his apprenticeship and training with a local competitor following a brief spell as a sub contractor. He holds NVQ2 and CSCS and is still continuing to learn , gaining experience and honing his skills. Paul is the newest member of the installation team and will shortly begin his NVQ apprenticeship with Floor Skills.